Our previous work showed that combining segmentation and tracking gives improved tracking performance compared to bounding-box approaches. The key idea is to define a probability distribution over the pixels belonging to each of the targets and the background. 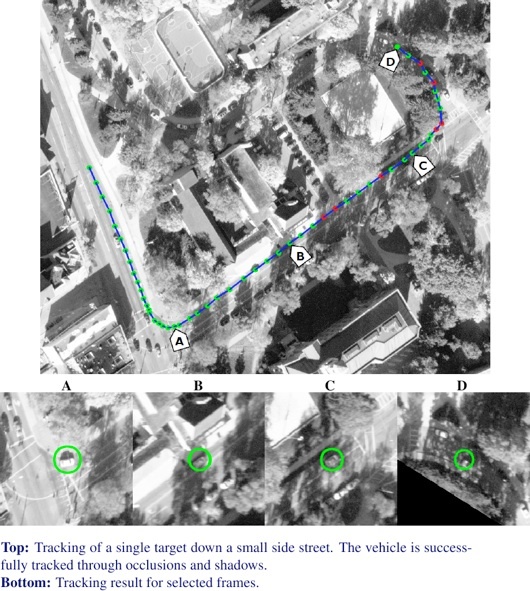 These distributions can be used both to segment and track the target resulting in very robust tracking which is able to avoid common tracking errors such as drift and target switching. We have extended the same basic idea to the challenging CLIF2007 dataset, which is a 2 hour sequence of aerial video captured by a UAV. 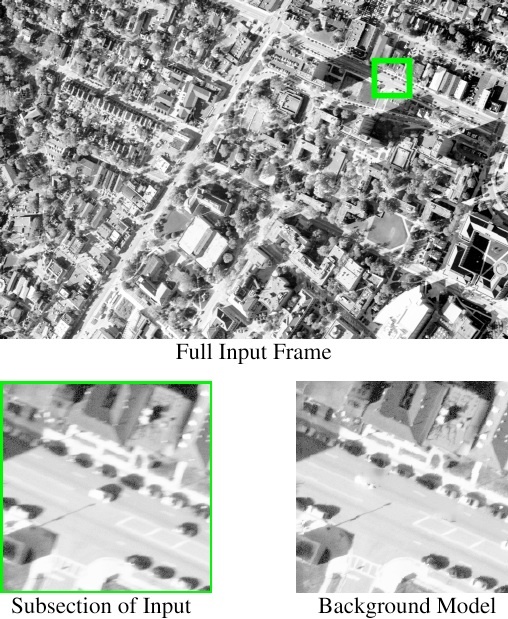 The CLIF2007 dataset has a low framerate (2fps), huge image size (6 cameras each at 10 megapixels), and relatively poor resolution (a few hundred pixels on target) compared to typical tracking datasets. The images below show an example of the scaled full input frame and how a subsection of this input looks. We also show the background model corresponding to this section of the input. The primary difficulty in extending our previous work to the CLIF2007 dataset is generating a good probability distribution for the background. The UAV is constantly turning resulting in a large amount of global motion. Also, there are many other vehicles on the road which must be accounted for to avoid tracking merging and switching. 1. Compensate for the global camera motion by finding an affine transformation between frames. 2. Generate local background patches around each target from the previous frame and determine their best matching location in the current frame. 3. Detect any remaining differences between the background model and the input which cannot be explained by one of the targets and account for these differences by generating auxiliary targets.